Caring of self, neighbors and the environment. Commitment to Service through volunteerism & community responsibility. Ensuring Continuous Growth through ongoing education and exposure to opportunities. Dignifying Women through continuous education, motivating forums & networking. A-WOW Global Initiative (A-WOW) is an organization committed to leadership development and enhancing cultural and socio-psychological change through the interactions between different cultures. These cultural exchanges foster and promote education, leadership, and innovation while at the same time collectively tackling issues of illiteracy, poverty and teen pregnancy among the most vulnerable populations in Ghana, Nigeria, Liberia, Costa Rica and the United States. 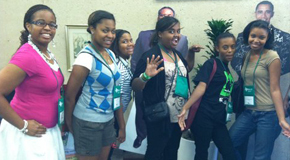 A-WOW works with emerging leaders ages 16-24 to build sustainable solutions for the next generation of leaders. Our approach is to utilize a variety of educational methodologies to promote life-skills, leadership development, innovation and entrepreneurial skills. Our unique designed curriculum equip young women to successfully demonstrate a commitment to lifelong learning which includes authentic leadership and character development, life skills and social competencies. Young women successfully exhibit personal and professional skills; these skills help them to act as resources, contributors, mentors, and volunteers in a variety of leadership role to help them become positive change agents for home, community, businesses and beyond. As a non- governmental 501c3 and registered NGO, we aim to strengthen emerging leaders’ sense of self-worth, self-awareness, and desire for self-improvement. We assist young women in developing innovative ways to support and give back to their communities by forming beneficial relationships resulting in economic empowerment. We believe young women need opportunities to express themselves in a world that makes them question who they are and what roles they should play as an adult. 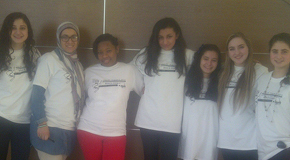 Our aims are to educate, empower, and enrich irrespective of social, religious or ethnic backgrounds. A-WOW INC. a 501 c 3 and NGO serving Costa Rica, Ghana, Liberia, Nigeria and United States that actively promotes multiculturalism,leadership,education and innovation.